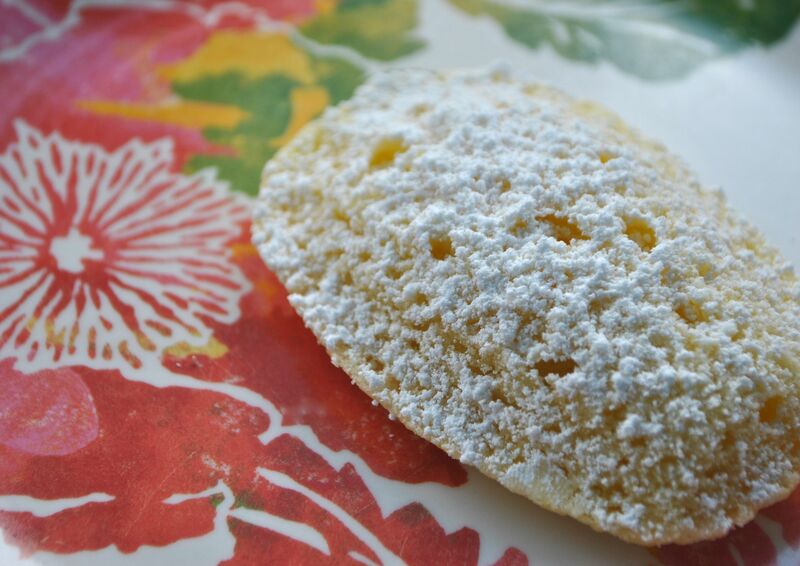 I baked a pan of Lemon and Rose Madeleines for a morning gathering with girlfriends, to plan an upcoming dinner. We sat out on the back porch and enjoyed the mild weather and lively, creative conversation. These would be perfect for any gathering – but most especially a pretty spring brunch. Heat oven to 375. Prepare tins: Brush molds with melted butter and dust lightly with flour. In a small saucepan over low heat, warm remaining 6 tablespoons butter until just shy of liquid. Stir in lemon zest and set aside to cool until butter is tepid but still very soft. Meanwhile in a mixing bowl, combine cake flour, baking powder and salt. Use an electric mixer to beat eggs and sugar until very thick and light in color, about 4 minutes. Add lemon juice and rose water and blend 10 seconds. Sift half of flour mixture over eggs and, using a rubber spatula, gently fold in. Repeat with remaining flour mixture. Quickly but gently, fold in cooled butter until incorporated into batter. Immediately spoon batter into madeleine tins. Bake until centers of cookies spring back to the touch and edges are golden brown, 8 to 11 minutes. Let madeleines sit in pan 5 minutes, then turn out onto a rack to cool. Dust with confectioners sugar before serving. That sounds so good! Must try them.